2018 marks the 10th anniversary of the Movri Mtn Earthquake in Greece. 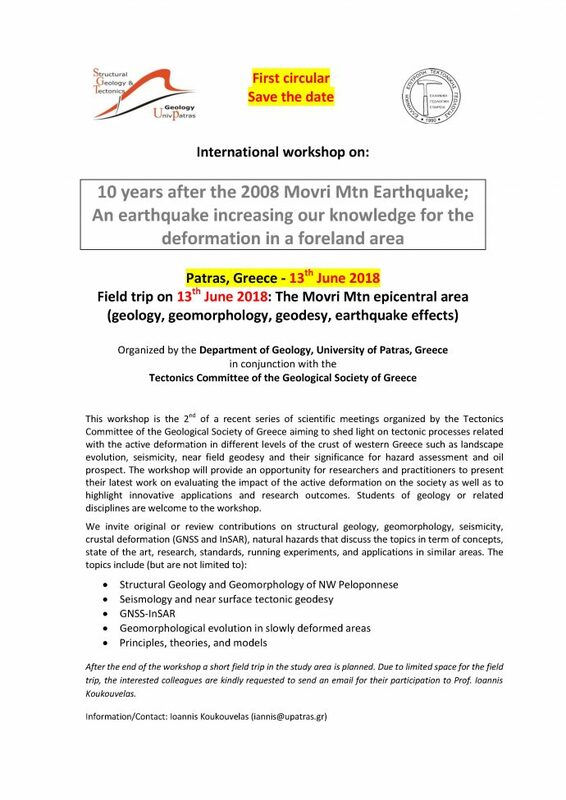 A workshop will be held in Patras on the 13 June, 2018, with a field trip to the Movri Mtn epicentral area (geology, geomorphology, geodesy, earthquake effects). The trip is organised by the Department of Geology, University of Patras, Greece, in conjunction with the Tectonics Committee of the Geological Society of Greece. This workshop is the 2nd of a recent series of scientific meetings organized by the Tectonics Committee of the Geological Society of Greece aiming to shed light on tectonic processes related with the active deformation in different levels of the crust of western Greece such as landscape evolution, seismicity, near field geodesy and their significance for hazard assessment and oil prospect. The workshop will provide an opportunity for researchers and practitioners to present their latest work on evaluating the impact of the active deformation on the society as well as to highlight innovative applications and research outcomes. Students of geology or related disciplines are welcome to the workshop. I read most of them because i’m interested to the relationship between faults and seismicity. This is helps to constrain the seismic hazard related to active fault zone in Tunisia. so, i hope to participate to this workshop. I attended an ICTP workshop in Trieste-Italy ‘Active faulting’-seismicity’.